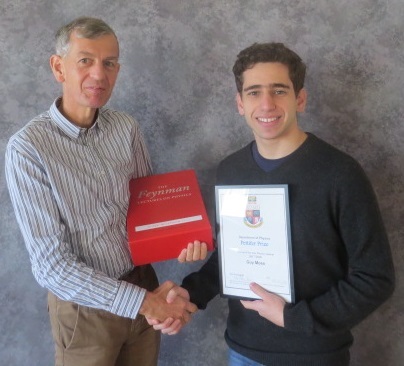 The Pettifer Prize is presented annually to the first year Physics student with the best overall examination performance. It honours the memory of Dr Robert Pettifer, who was a member of the Department from 1972 until his retirement due to ill-health in 2007. The 2017/18 prizewinner is Guy Moss, who receives a copy of the Feynman Lectures on Physics. The prize was presented by Robert's wife, Mary, and daughter, Candice, who kindly donated an Amazon voucher to add to the prize.